For all the advances in cool consumer gadgetry in the last decade — from Ipods to High Definition Television to the proliferation of satellite radio and television — there is one thing that keeps contemporary gadgets tethered to the past: their wires. That may begin to change in the next year. CNET reports today that "several leading consumer electronics companies are expected to announce… that they are working together to develop a new standard for transmitting high-definition audio and video signals wirelessly." The new standard is to be known as WirelessHD, "with the stated goal of enabling wireless connectivity for streaming HD content between source devices and high-definition displays." Televisions are the "natural" application for [WirelessHD], said John Marshall, president of WirelessHD. Eventually the technology will make its way into adapters for source devices like notebook PCs, digital video recorders, HD disc players, digital audio players and digital cameras. Because it does not compress the digital video, the experience will be the same as using a high-definition multimedia interface (HDMI) or digital video interface (DVI) cable, he said. The specification will maintain high-quality video, ensure the interoperability of CE devices, protect from signal interference and use existing content protection techniques, Marshall said. WirelessHD will use the unlicensed 60GHz radio frequency band to send uncompressed HD video and audio at 5 gigabits per second at distances of up to 30 feet, or within one room of a house. While most other wireless audio and video transmissions occur in the 2.4GHz-to-5GHz range, WirelessHD says neither will allow the fast transmition speeds required for high-definition content. Among consumer electronics companies that are already releasing products capable of interoperability with the draft specifications is Apple, new line of Intel Core 2 Duo-based iMacs sport AirPort cards capable of supporting 802.11n, "which supports connection speeds of up to 540Mbps, or a 10-fold increase compared to existing 802.11g networks," according to Think Secret. Speaking of Apple — rumors persist that the company is set to unveil both a 50 inch monitor and the new iPhone in January. But will we need to connect them with cords? 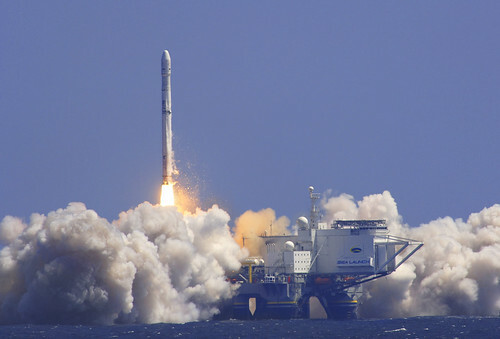 A Zenit-3SL vehicle lifted off at 3:49 pm Pacific Standard Time (23:49 GMT) from the Odyssey Launch Platform, positioned at 154 degrees West Longitude in the equatorial Pacific. All systems performed nominally throughout the flight. The Block DM upper stage inserted the 5,193 kg (11,448 lbs.) spacecraft into geosynchronous transfer orbit, on its way to final orbital position of 115 degrees West Longitude. A ground station at Hartebeesthoek, near Pretoria, South Africa, acquired the first signal from the satellite in orbit. I think you’ll enjoy the video. 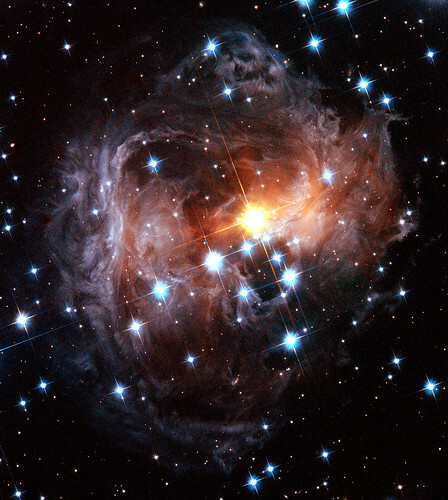 The unusual variable star V838 Monocerotis (V838 Mon) continues to puzzle astronomers. This previously inconspicuous star underwent an outburst early in 2002, during which it temporarily increased in brightness to become 600,000 times more luminous than our Sun. Light from this sudden eruption is illuminating the interstellar dust surrounding the star, producing the most spectacular "light echo" in the history of astronomy. NASA officials met Friday to decide whether to risk a space shuttle flight on a mission to repair the Hubble space telescope. Michael Griffin, the agency administrator, is scheduled to announce Tuesday at Goddard Space Flight Center in Greenbelt, Md., whether the mission will take place. NASA says a mission to repair the Hubble telescope carries a higher risk. (NASA/Associated Press) Although the space agency hasn’t said anything officially, University of Wisconsin-Madison astronomer Jay Gallagher, a member of a science team responsible for a camera in the Hubble telescope, says the signs are promising. The 16-year-old telescope has been repaired four times since its launch in 1990. A fifth repair mission was cancelled after the 2003 space shuttle Columbia tragedy that killed seven astronauts. NASA officials decided to cancel any future repairs of Hubble, saying it was a matter of shuttle safety. If a spacecraft heading to the telescope encountered a problem, there would be no safety net, since the astronauts would not be able to reach the International Space Station from Hubble’s orbit. If Tuesday’s announcement gives the go-ahead for the mission, it could prolong Hubble’s ability to capture some of the most spectacular images of the universe well into the next decade. If the repair doesn’t take place, the telescope will deteriorate by 2009 or 2010. Well, it looks like the party might soon be over for the generations of euro-tripping backpackers who’ve snuck a few bottles of French wine into Germany or bottle of the illicit green stuff from central europe into Ole’ Blighty… shucks! Our good friends at vnunet are reporting that Heineken Brewery (makers of Dutch delight drunk around the world), in association with IBM, international shipping company Safmarine, Vrije Universiteit Amsterdam (University of Amsterdam), and customs agencies in the US, UK, and the Netherlands, are beginning a program to track cargo container shipments of Heineken beer from Europe to the United States using satellite and cellular technology. Called the "Beer Living Lab," the main goal of the project is to create a paperless documentation trail using IBM technology to provide real-time visibility of the product and interoperability through wireless sensors linked to its WebSphere platform. "[It’s] the first step in building the ‘Intranet of Trade’, which will help to substantially improve efficiency and security in the global supply chain." "Once accepted and implemented widely, paperless trade will support initiatives that will eliminate most inspections on arrival, thus significantly speeding up ocean freight shipments and improving the profit margins for shippers." While this might mean it might be a little harder to sneak some booze across the border (especially if and when the technology is combined with RFID tagging of shipped spirits), the potential savings that could be passed down to consumers and improved port security probably evens things out a bit. Want even more information about the Beer Living Lab? Think about taking a brief sojourn to Amsterdam in the next few days… the lab seems to be having a workshop on the technology on Thursday. "The Progress M-58 cargo ship, carrying supplies to the station’s three-man crew, docked at the station Thursday at 6:28 p.m. Moscow time (10:28 a.m. EDT) on autopilot, as planned. Mission Control could not confirm, however, that its antenna had folded as required for the craft to clamp securely on the station although later it announced that it had solved the glitch." Fortunately, Mission control reports, the crew, which was never in danger of being without food or oxygen, has opened the cargo ship and begun unloading supplies. In other ISS related news, the billionaire who helped create Microsoft Excel and Word, Charles Simonyi, is supposedly set to be the next space tourist according to the Seattle Post Intelligencer. Simonyi is currently set to join the Space Station crew for eight days (during a ten day mission) aboard a Russian Soyuz spacecraft set to launch on March 9,2007. Everyone will, of course, be able to follow Simonyi on his travels through his blog at charlesinspace.com. While I’m not really certain what this all means, it has lead to some really amazing images and movies. Astronomers have new evidence that the Andromeda spiral galaxy was involved in a violent head-on collision with the neighboring dwarf galaxy Messier 32 (M32) more than 200 million years ago. This infrared photograph taken with NASA’s Spitzer Space Telescope revealed a never-before-seen dust ring deep within the Andromeda galaxy (highlighted by the inset). When combined with a previously observed outer ring, the presence of both dust rings suggests that M32 plunged through the disk of Andromeda along Andromeda’s polar axis approximately 210 million years ago. Check-out a high resolution image of the collision (2.1 MB) and a great simulation of the collision. "Astronomers have predicted that Andromeda and the Milky Way will collide in approximately 5 to 10 billion years. That collision will erase the separate identities of each galaxy, leaving a single elliptical galaxy in their place." Transmission test begins at 23:00 GMT, with the live transmission beginning at 23:35. Launch window opens at 23:49 and closes 00:57 on 27 October 2006. Or you can watch the webcast. "The STEREO mission is about to begin. Safely installed atop a Boeing Delta II rocket, the twin spacecraft are ready for launch Wednesday at 8:38 p.m. EDT. The vehicle’s second stage was loaded with storable propellants on Monday. The launch weather forecast remains favorable, with virtually no concerns. High pressure behind a passing front has brought pleasant conditions for the next two days. There is still only a 5% chance of weather violating launch constraints, due to possible development of thick clouds." The launch blog will start reporting the happenings starting two hours before the launch (around 7pm EST). The STEREO (Solar TErrestrial RElations Observatory) Mission, for those who don’t already know, intends to use stereoscopic 3D vision to construct a complete picture of a sun and the nature of solar flares. In addition to helping us know a great deal more about the world’s most important star, the mission should help us learn how we can best protect future astronauts from the dangerous effects of solar flares. SKY Perfect is currently looking into strengthening its relationship with and possible merger with JSAT, but nothing definite, including the stock transfer ratio, has been decided on at this stage. SKY Perfect will immediately disclose if anything on this matter is decided. Japanese satellite broadcaster Sky Perfect Communications Inc. will acquire satellite communications company JSAT Corp. and create a holding company next spring, the Nihon Keizai business daily reported in its evening edition on Wednesday. The paper said Sky Perfect will become a holding company, while creating a new entity for its operations. The holding company will bring the new firm and JSAT under its umbrella. Each JSAT share will likely be swapped for about 4 shares in the holding company, the paper said. Based on Sky Perfect’s closing share price on Wednesday, the deal would value JSAT at around 93.7 billion yen ($786 million), 7.5 percent below actual market capitalisation. Shares in Sky Perfect closed down 1.9 percent at 65,700 yen, and JSAT ended down 2.4 percent at 284,000 yen. They underperformed the benchmark Nikkei average’s 0.48 percent fall. Sky Perfect currently does not own JSAT shares. JSAT, which transmits programming for Sky Perfect’s Sky PerfecTV, holds a 6.9 percent stake in Sky Perfect. Interesting to note SKY Perfect, the leading satellite TV service in Japan, started up its own IPTV service, OptiCast. For about $25 (3,000 yen), you get 68 channels. Such a deal. Although none of the teams were declared winners, the University of Saskatchewan Team (USST) was just two seconds short of winning the prize, as they managed to climb 200-foot- high carbon fiber ribbon in two seconds over the time allotted to them. "For year one, we attracted seven teams and didn’t climb the tether. This year we had four teams make it up to the top, and one came very close to claiming the prize. We didn’t want to make the competition too easy and we can’t make it too hard, so it looks like we are walking the line." Interested in taking a stab at the challenge during next year’s cup? Looks like you might have an even greater incentive to succeed: Shelef announced that the prize money from this year’s competition will rollover to next year’s, leaving the climbing and tether strength competitions with a combined purse of $500,000.